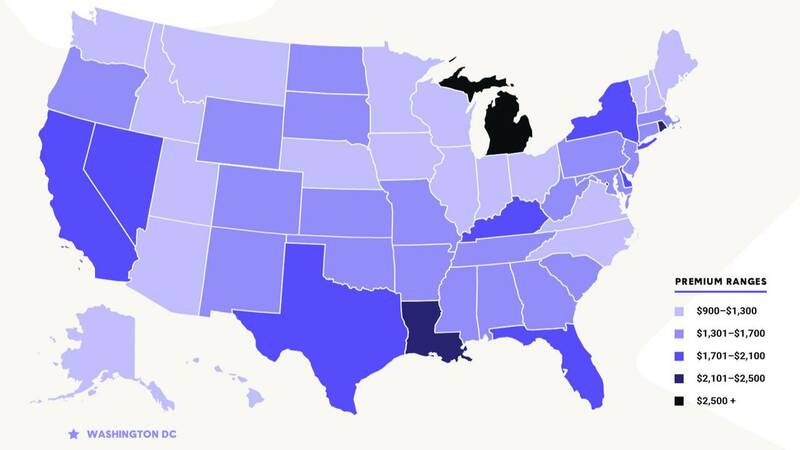 DETROIT - It's no secret that Michigan auto insurance rates are high, but a new report finds rates in the state outpace any other. The Zebra, a leading car insurance search engine, released their 2019 State of Auto Insurance Report, which finds that car insurance rates have increased for four out of five American drivers in the last five years. In fact, rates across the U.S. are higher than they've ever been — up 23% since 2011 with an average annual cost of $1,470. The report states Michigan has the highest insurance rates and Detroit has the highest for any city. "Some people are paying $500 a year while others are paying $5,000. Why? It could be weather in your state, your driving habits, or even your gender, marital status, or credit score," says Alyssa Connolly, Director of Market Insights, The Zebra. "Car insurance is a major expense for most Americans, and drivers want to know how much their rates are changing — especially as new technology comes into play."